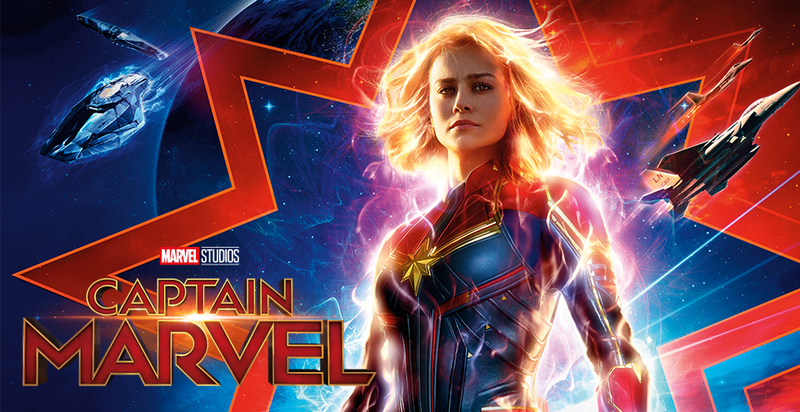 Captain Marvel offers moviegoers a high-flying, entertaining adventure, following free-spirited Kree warrior Vers on a quest to uncover her past. New film release Captain Marvel offers a little bit of everything. From photon energy-fused fiery fists that can obliterate whole ships to dangerously suspicious tabby cats, it’s undoubtedly a success in the Marvel cinematic universe, breaking the $1 billion mark at the global box office. Movie-goers find themselves blasted back in time to the groovy ‘90s, filled with Blockbuster video stores, painfully slow internet speeds, dramatic street car chases, and plenty of alternative rock for those Nirvana junkies. Captain Marvel combines the high tech fictional Kree world with hilariously outmoded mid-90s America. The balance of earthly quirks and space-y science fiction elements makes for a wildly engaging and entertaining movie. First female-fronted Marvel film Captain Marvel blasted off to a $154 million debut and has surpassed a milestone of $1 billion worldwide, making it the seventh Marvel film to reach this mark. The film has become Marvel’s first blockbuster that centers on a female superhero, starring actress Brie Larson as strong-willed, mildly sassy Captain Marvel. Protagonist Vers struggles with flashbacks of a life as Carol Danvers in the United States Air Force, test-piloting planes with passionate comrade Maria. Yet Vers only ever remembers being a Kree soldier, so why is she haunted by these memories of her on Earth? With flaming fists and a headstrong personality, Vers is the muscle of her galactic crew. The group of Kree soldiers, each with unique skill sets, were sent on a mission by computer conscious “Supreme Intelligence,” taking a detour to planet Earth, so-called C-53 in the film. After a space scrimmage, Vers crash-lands in mid-90s California, coming face-to-face with a young and two-eyed S.H.I.E.L.D agent Nick Fury. Moviegoers see Fury in a new light as we are introduced to a less brusque side of Samuel L. Jackson, one in which he is an unarguable cat-lover. Fury’s gushy feline-loving self brings the perfect comic relief amidst all the action and self-discovery crisis. Crimefighter Fury pairs up with extraterrestrial trooper Vers to help uncover her past, the animated pair accompanied by a suspicious orange cat Goose. Vers is on a mission and will stop at nothing to discover who she actually is. Breezy and confident in her strength, she travels across Earth with Fury to fill in the missing gaps of her memories, all the while an intergalactic war raging on in the background between Vers’ people, the Kree, previously seen in the Guardians of the Galaxy films, and the green-skinned, shape-shifting Skrulls. Brie Larson emanates the perfect tough female superhero vibes, pushing to defy female stereotypes. Portraying Vers’ impulsive and charming characteristics, Larson brings about pure, lovable energy in her acting. “I think [Vers] has an ego, but in a healthy way. She doesn’t have an unrealistic expectation of herself. She just owns that she’s really good and really skilled, which feels good to play,” Larson said in an interview with Collider. “She also has an incredible sense of humor and makes fun of herself, makes fun of other people, has no issue if someone makes fun of her. I will say that this character is probably the most dynamic character that I’ve ever played,” Larson stated. Accompanying the humourous banters between Vers and Fury, the ‘90s vibes are pleasantly evident in the film, brought to life by soundtracks from Salt-N-Pepa, Nirvana, and TLC. From payphones and VHS movies to Vers’ knee cap-ripped jeans and a flannel tied around her waist, the film definitely brings a wave of nostalgia that 21st-century kids don’t quite appreciate. Blending retro ‘90s America with exhilarating superhero and science fiction elements, Captain Marvel has undoubtedly outperformed expectations in the box office. Despite some mixed reviews, fans are overall satisfied with the outcome of the film. The film is altogether a joyful entertainment for moviegoers. While it may lack in originality and experiences some plot mistakes, the film set ablaze a new, high-flying addition to the Marvel Cinematic Universe. There are more pleasures than faults in the movie, such as the electrifying action and, of course, Goose the tabby cat. You can never go wrong with cats, after all.